You can make any holiday celebration special by using selected cookie cutters to decorate with. Cookie cutters are non-denominational and come in any size and shape. A fun winter break project to share with your kids. You can decorate with left over bits of ribbon, small buttons, and small pieces of fabric or felt. Cookie cutters provide a variety of shapes to be used as patterns for holiday ornaments. To make the patterns simply trace around the cookie cutters and add 1/4 inch (6 mm) seam allowances. Stitch the ornaments wrong sides together and leave the seams exposed for a homespun look. 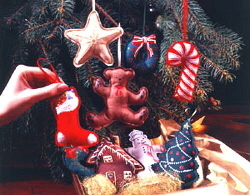 Make the ornaments from cotton or cotton-blend fabrics. Add decorative details to the ornaments with fabric paints in fine-tip tubes. Hand-paint your own designs or follow the imprints of plastic or metal cookie cutters as a guide for painting the details. For best results in painting, prewash the fabrics to remove sizing. Practice painting on a scrap of fabric before painting on the ornaments to perfect the painting techniques. To keep the paint flow even, tap the tip of the bottle gently on the table to eliminate air bubbles. Wipe the tip of the bottle often while painting, to prevent paint buildup. If the tip becomes clogged, squeeze the tube to force paint through the tip onto a sheet of paper or a paper towel. If necessary, remove the cape and unclog the tip with a toothpick or needle. Make the patterns (see step 1). For each ornament, cut two pieces from fabric, wrong sides together. 9 (23 cm) length of ribbon or cording, for hanger. Fabric paints in fine-tip tubes, for decorating ornaments. Transfer cookie-cutter design to paper by tracing around cookie cutter with a pencil; add (6 mm) seam allowances. Cut fabric pieces for ornaments. Fold ribbon in half to make hanger; glue-baste to top of ornament as shown. Place the fabric pieces wrong sides together; pin. Stitch (6 mm) from raw edges, using short stitch length; leave 1 (2.5 cm) opening for stuffing. Stuff ornament with polyester fiberfill; use eraser end of a pencil to push stuffing into smaller area. Stitch opening closed, using a zipper foot. Trim seam allowance to 1/8 (3 mm), taking care not to trim off hanger. Add painted details to the ornaments as desired, using fabric paints. Mark stitching lines lightly with pencil or chalk when the seam allowances overlap. Paint details on ornaments using paint tube as a pencil; keep point on fabric while painting to get the finest line. Trim around the ornament using pinking shears, if desired, for a decorative edge finish.